Multi-Boot and Multi-OS on Mac Pro – the best way. Being a total PC geek, I have always been anti-mac. This is to say, of course, until I joined the iPhone bandwagon and started development for the iPhone, which requires Mac Hardware. Now that Mac hardware is all intel based, however, I find myself still falling back to Windows installs as often as possible. And now that I have seen how incredibly any operating system runs on my Dual Quad Core 2.8Ghz Mac Pro with dual video cards, 16-gb of RAM, and four 1TB Western Digital Black 1TB hard drives, I am truly enjoying mac hardware. Traditionally, Apple has provided a Boot Camp installer – which is a great tool when you want to share a single drive to run multiple operating systems. Boot camp will shrink your OSX partition, create a landing spot for your favorite flavor of windows and then kick off the installer for you. What you get in the end is a PC with a single drive that contains multiple partitions – one of which will be your “default” OS, and the other which can be selected for restart using the boot camp manager or can be picked on the fly by holding down the OPTION key as the mac starts up. As I have illustrated in an earlier article, all of this hubbub is totally un-necessary on the Mac Pro. The Mac Pro is a standard EFI PC, and can boot straight off of the windows installer disk just as well as it can the Mac OS installer disk. Additionally, the Mac Pro is the only PC (thus far) in the Apple lineup that supports multiple hard drives – four, to be exact. In this article – I will walk you through creating the ultimate geek set up – modeled after my own Mac Pro, quad booting Mac OSX, Windows XP 64-bit, Windows Vista 64-bit, and Windows 7 64-bit. I will assume that you already have install disks for each of these operating systems, you have four bare drives – all of which have been installed in the Mac Pro’s drive Caddies. At the present time, do not place the caddies into the Mac Pro – we’ll do that one at a time. Power the Mac Pro up, eject the DVD drive, and insert the Mac OSX disc 1 into the drive. If the machine gives you an error because it cannot find a boot device, simply restart again once the CD is inserted. The Mac Pro should boot straight off of the install CD – but I always recommend holding the C key as soon as you power up the machine, which will force a boot from the DVD drive. When Mac OSX has completely finished installing, eject the installer DVD and replace it with the Windows XP-64 bit install DVD. Close the drive tray and power off the machine. Gently pull out the Mac OS Hard Drive located in Bay One just far enough so that it is no longer connected to the motherboard – 1/2″ should be fine. Fully install your second bare hard drive into the second bay. Power up the machine and hold down the C key to boot from the Windows XP DVD you placed in the drive in step 5. Follow the instructions to install Windows XP 64-bit on the machine. The system will restart many times. If the setup application fails to successfully boot and resume the installation process, restart the machine and hold down the Option key. Pick the Hard Drive Icon to boot from the hard drive and resume the install. Once Windows XP has completely finished installing, eject the installer DVD from the drive and replace it with the Vista 64-bit DVD. If the Vista Installer begins running, exit and then shutdown the machine. Gently pull out the XP64 hard drive located in bay two just far enough so that it is no longer connected to the motherboard – 1/2″ should be fine. Fully install your third bare hard drive into the third bay. Power up the machine and hold down the C key to boot from the Vista DVD you placed in the drive in step 9. Follow the instructions to install Windows Vista on the machine. The system will restart many times. If the setup application fails to successfully boot and resume the installation process, restart the machine and hold down the Option key. Pick the Hard Drive Icon to boot from the hard drive and resume the install. Once Vista has installed successfully, eject the installer DVD from the drive and replace it with the Windows 7 installer DVD. If the Windows 7 installer begins, exit and then shutdown the machine. Genlty pull out the Vista hard drive located in bay three just far enough so that it is no longer connected to the motherboard – 1/2″ should be fine. Fully install your fourth bare hard drive into the fourth bay. Power up the machine and hold down the C key to boot from the Windows 7 DVD you placed in the drive in step 13. Follow the instructions to install Windows 7 on the machine. The system will restart many times. If the setup application fails to successfully boot and resume the installation process, restart the machine and hold down the Option key. Pick the Hard Drive Icon to boot from the hard drive and resume the install. Once Windows 7 has installed correctly, eject the installer DVD from the drive and close the tray. Push all of the hard drives completely into their bays and close the Mac Pro case. This completes installing all of the Operating Systems on your machine. At this point, Mac OSX should boot by default, and you can pick any of the other Windows installations by holding the ALT key during the boot sequence. You’re not done yet. One of the things that could cause a problem at this point is that Mac OS will be able to see all of the Windows Partitions, and each of the Windows partitions will be able to see each of the other Windows partitions. This doesn’t actually create a problem right off the bat – but if any of the partitions are edited by one of the other operating systems either inadvertently or on purpose, you could end up with a system that won’t boot. Assuming you only have one DVD Drive in your Mac Pro – you’ll notice that the hard drive representing your current active OS will be your C: drive, your DVD drive will be your D: drive, and then you will also see an E: and F: drive representing the other two Windows installations. We want to make sure that the E: and F: drive no longer appear. Find the first hard drive partition after your DVD-ROM drive (most likely E:). Right click the area containing the drive letter, and then click Change Drive Letter and Paths. Click the Drive Letter, Click Remove, Click OK on the “warning” and then click OK again. Reboot the PC, boot the next windows installation, and repeat the same steps. Do this for Windows Vista AND Windows 7. These steps will ensure that your windows installations do not inadvertently step on one another. Enter your password. This is a UNIX based text editor. Depending on your OS version, this file will most likely be blank. If there are already entries in here, scroll to the bottom of the file and put your cursor in the first column of a new line. Once Disk Manager populates all volume information, you should see a tree view with four drives. Underneath each of the drives there will be individual partitions. The first drive is Mac OSX, we don’t want to do anything with this one. The second drive is Windows XP 64-bit. There should be one partition on this drive. Click the partition, then press command-I to get information. You will notice a “Universal Unique Identifier” – this is a GUID that identifies that partition. Expand the window so that you can see the entire number and copy it to the clipboard by hilighting it and pressing command-C.
Repeat the same thing by pasting the identifiers for the partitions on the remaining two drives much like you did in the previous steps. When you are finished, you should have one line for each partition you want to HIDE from Mac OSX. Press CONTROL-X to exit pico. Now you have happily installed Mac OSX, XP64, Vista 64, and Windows 7 64 on your Mac. You’ll want to finish each install by going into device manager and ensuring that all drivers have been installed. On the Vista and Windows 7 partitions, you can use the MAC OSX CD to install the Boot Camp control panel and remaining drivers. When all is said and done, you’ll have four absolutely clean and segregated installations, and one sweet running rig. One of the biggest concerns I had with Windows7 were the claims that it was even lighter weight than prior operating systems. As most of us developers already know, this statement is generally B.S. The more advanced the version number, the more bloated the code, right? Not so much. As you can see from the performance specs attached to this blog post – the numbers for the Atom are relatively low (2.2 on a scale that goes to 7.9) – but I am very impressed thus far with the snappiness of Windows 7 – it actually “feels” quicker than the previous Windows XP Pro install. 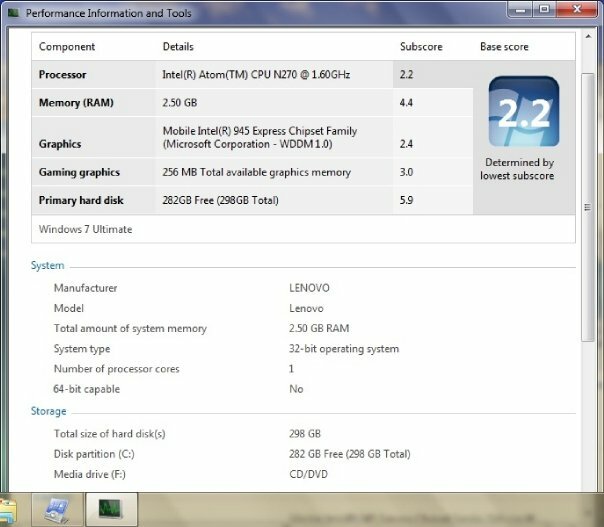 Now, I have added a 2GB RAM stick to the Lenovo S10, and have also added a WD Scorpio 7200RPM 320GB SATA HDD. This is reflected in the overall performance specs. As a matter of fact, I installed Windows 7 64-bit on my Mac Pro with a relatively lackluster WD 2500KS 250GB drive and the benchmark on the S10 is actually better than that of the drive in the Mac Pro! Another interesting note is that it is well known that the Lenovo S10 has a two gigabyte memory limit, it comes with 512MB on the board, and then with a 2GB stick – you still only see 2GB of RAM instead of 2.5GB in Windows XP or Vista. Suprisingly, Windows 7 is reporting the full 2.5 GB. I dont know if this means it can use it or if it just knows that it is there, but it is definately reporting the extra 512MB correctly. The other benefit thus far to Windows 7 is battery life. My typical full battery drains on the S10 have been around 2.75 to 3 hours at best when using the balanced power plans. My first two full battery drains since switching to windows 7 have yielded 3.25 and 3.5 hours runs – impressive to say the least – especially given that my S10 only has the standard 3 cell battery. Windows 7 Delivers on promise of faster networking. * DISCLAIMER – Windows 7 is beta software which means that any benchmarking results regarding networking performance are not necessarily representative of the results expected by the final product, NOR are they intended to indicate the performance of the final product. That being said, as I sit here and type this entry, I am happily uploading a ghost backup of my latest Windows 7 installation from my Lenovo S10 to my server for archiving. Although that doesnt sound that interesting, I am monitoring the networking tab in task manager, and what is interesting is that for the first time in a long time, I am seeing 98% network utilization. The 10GB file that I am sending to my server over a 100 megabit connection is averaging around 9.64 MB per second – respectable since this same machine, after all patches to Vista were applied, struggled to get 2MB when performing the same task. As a true test, I installed Windows7 on my Mac Pro this evening. With a gigabit network connection, I was hoping to see at least 20-30 MB per second speed for successful proof that Windows7 has licked the Vista networking woes. On the Mac Pro, I struggle to sustain a 10-15MB per second transfer despite a gigabit connection with Vista 64 Ultimate. I’m happy to report that in my 2GB file test, on the Mac Pro with Windows 7 Ultimate 64-bit beta 7000, I was able to average over 60MB/s on a gigabit upload. Averaging 80-90% utilization! Hooray Microsoft!! In my preliminary testing of this beta at least, the default configuration seems to bypass all of the networking woes that Vista was plagued with.